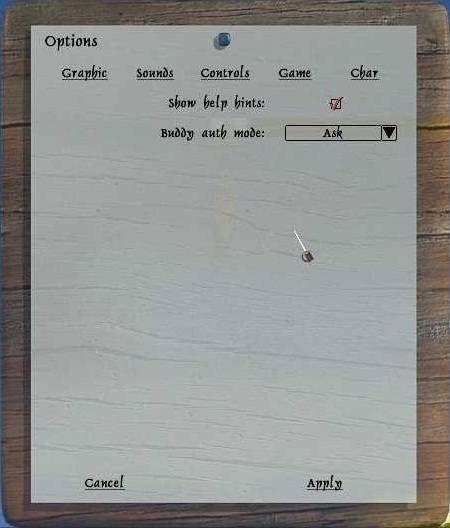 When you click options you get a lot of options. 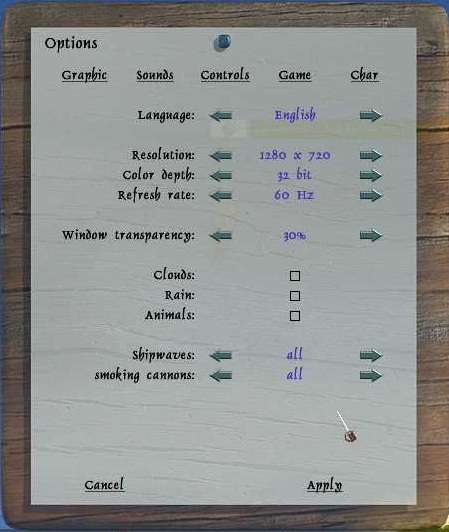 The part you start at is graphic, here you can change language between English and german. See the refresh rate.Change the transparent so you can see stuff behind the windows. Click or unclick clouds, rain and animals. Set ship waves to none, only own or all. Set smoking cannons to none, only own or all. 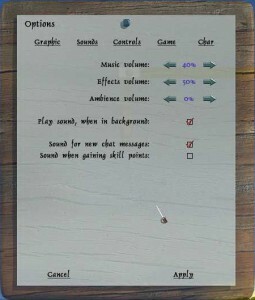 At the sound option you can set the music, effects and ambience volume as you prefer. 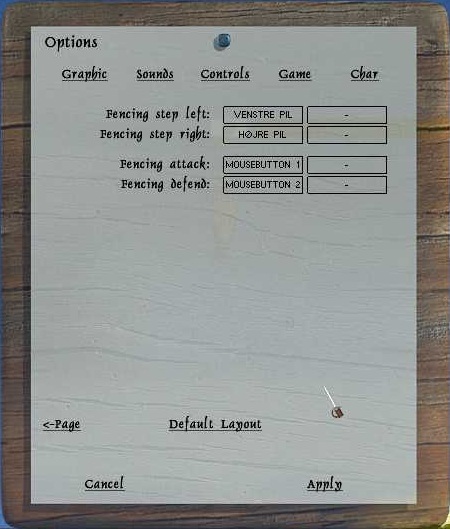 Decide if you want to play sound, when in background. 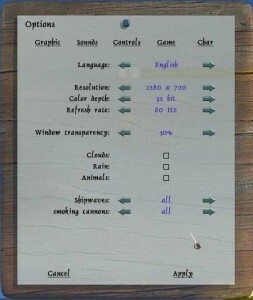 Decide if you want sound for new chat message. And as last option here you can have sound when gaining skill points. you like to play or to fit your country keyboard layout. 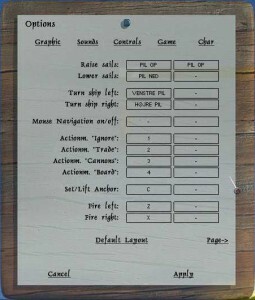 On the first page you got ship controls, here you can set how you like to steer your ship. Set how to change between the 4 different modes.What key to use for anchor, anchor is often used in battles. And what keys to shoot your cannons. 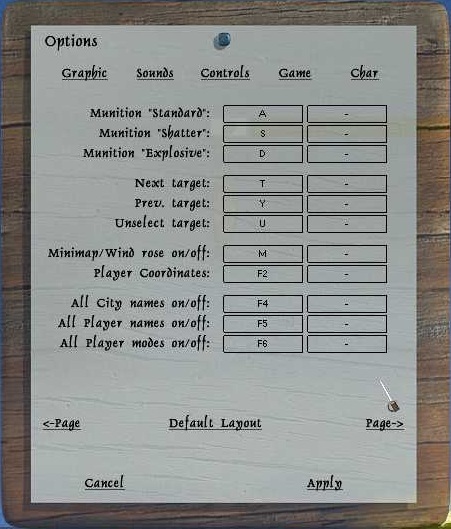 On page 2 you can set keys for the 3 types of ammunition. 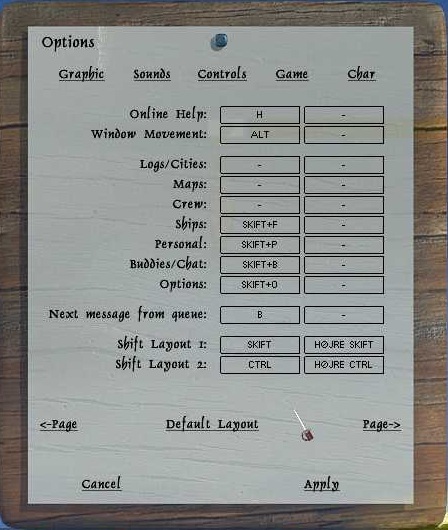 How to change target or unselect target. Minimap/wind rose on/off is in each top corner when you are at sea. like coordination in minimap, names and what mode player is in. 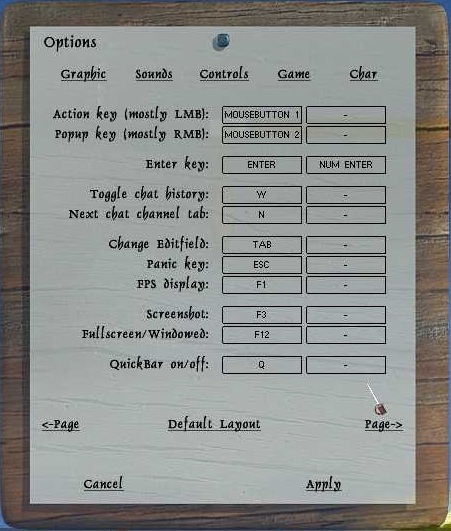 On page 3 you got all the keys for how to get the menu to appear.Keys to control chat. More details about chat her. Next you got what keys you want for editfield. 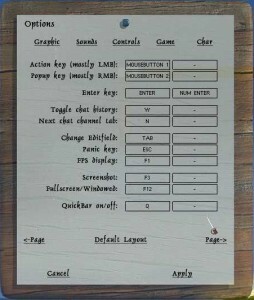 Panic key and fps display to see you ping and fps. Screenshoot key, to take picture of your screen. Will be saved in the WoP folder under screenshoots. Key to change between fullscreen and window mode.Quickbar on/off, read more about the quickbar here. On page 4 you got the keys to control waypoints. The Quickbar part you don’t need as it says as bottom in red. 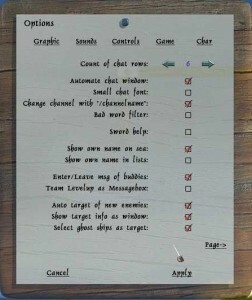 Page 5 you got the online help, this can be useful for newbies. Window movment. After this you got keys to pop up all the parts in the menu. Next message from queue, can be helpful to easy look all messages about jobs completed. 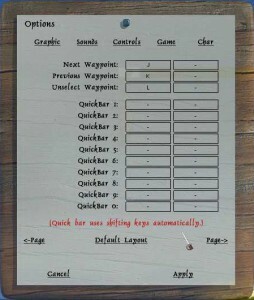 Shift layout 1 and 2, this is to get 2 extra pages in the quickbar, read more about quickbar here. Page 6 you got the keys you need to use for fencing. First the step keys to move your character forward or backward. Keys to attack the opponent or block the opponents attack. More about fencing here. 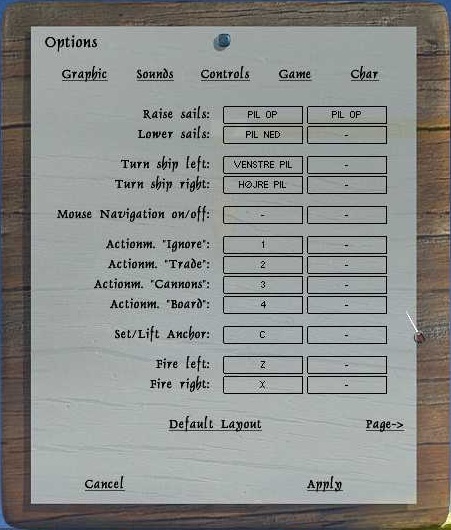 When you press game you get some pages with options on how you want it to look. On the first page you got a lot of options about chat. You can get more details about chat here. Bad word filter will make *** whenever a bad word is in chat. Sword help. For a full fence guide click here. 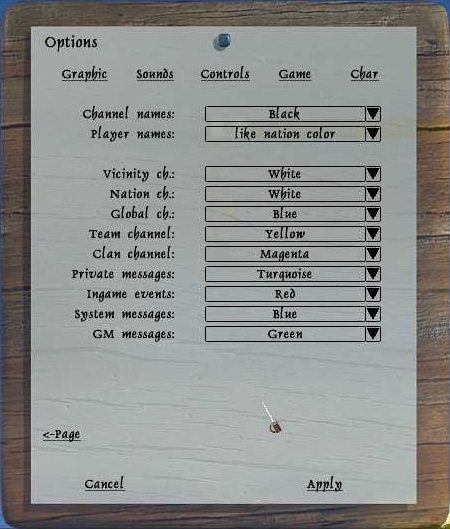 Next is options on when you want your own name to appear. Enter/leave message of buddies so you know when they come on or go off. Team levelup as message will provide you with a letter when team levels up. At the bottom is target options, here you can set it as you like. Page 2 starts with how much info you like to see about your enemies when you meet them. Show skill progress as points will allow you to see the point and not just a line in the status bar. Learn more here. Show new message hint. 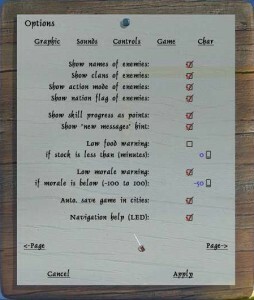 -100 your crew commits mutiny and take your ships. Auto save in cities is so if 30 min or more time as passed it will auto save as you enter a city. Navigation help (LED) is in the statusbar. Learn more about sailing here. Page 3 is all the colors of the chat, starting with channel names color and names color. 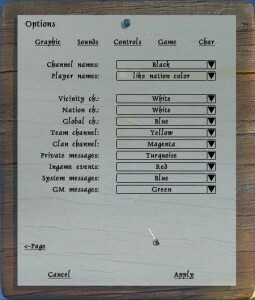 After this you can customize all the colors you see in the different chats. Like if you or anyone else chat in your nation you can deside what color the chat is. 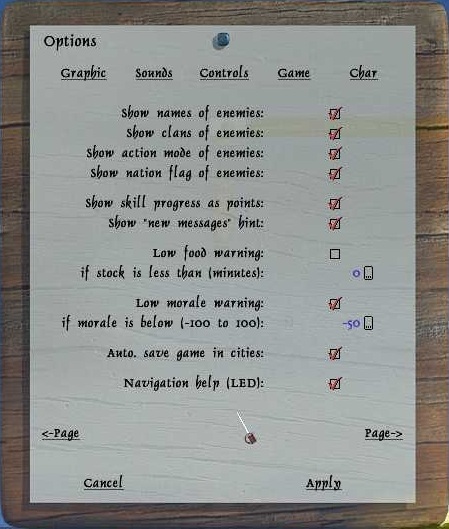 When you press char you only get 2 options Show help hints. where they ask to be your buddy and you then can decide to accept or decline their request. And last you can have it on ignore to auto ignore all buddy requests. Buddies can see when you enter and leave the world.